The actors¹ in ORDET usually do not talk to each other like human beings, instead in the fullest sense “reciting” their “lines” — this is obvious even to a man like me who does not speak Danish — and often as if projecting to a spot off in the distance, rather than at the other characters. The movements of the camera and of the characters are ultra-deliberate, almost (almost) to the point of mannered parody. 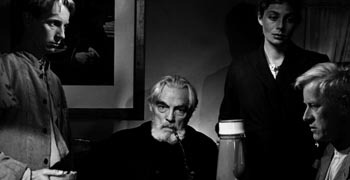 The images and the camera movement also have little depth and minimal perspective cues, giving the film a flat two-dimensionality — I believe the camera never moves into or out of an image, but only across it or on a diagonal — and creating the effect of watching a medieval tableau or a tapestry come to life. I shuddered at the thought of what the audience with whom I saw a different Dreyer masterpiece would make of ORDET — particularly the scenes where a “touched” Johannes walks onstage and offstage reciting parable-like lines usually having nothing to do with the immediate drama before the other characters — which is mostly a conflict between two extended families over a proposed inter-religious marriage. The Dreyer “look,” which that still above exemplifies, uses spare, starkly dressed sets and expressionist lighting schemes, with “pools” of light that have no natural source to produce what someone once called the “glowing wall” effect. It tends to isolate the characters, as if seen in their essence rather than their existence, and living out the conflicts inside a human soul. But the mannered lighting schemes almost always spotlight Johannes’s face, as if gracing him with a kind of aura, probably more and more-consistently than of any character in film history. The medium tends, after all, toward the realistic, making these sort of lighting schemes rarely practiced, and never with the level of rigor Dreyer uses in ORDET (they would be just this side of impossible in color). But by this point in history, words from me can seem superfluous — ORDET is securely canonized (and I use that word deliberately). But seeing the film anew in the specific context I did opened my eyes to it, and to myself, in ways it hadn’t before. In recent weeks and months, I’ve spilled a few billion 0s and 1s at various St. Blogs comboxes on matters related to the interrogation and treatment of terrorists and even began another site dedicated to it. To overstate, oversimplify and crudify, I’m about as pro-torture (I prefer “anti-anti-torture”) as it gets. I won’t rehearse the arguments here because they are not relevant in themselves, but seeing ORDET gave me the first doubts I’ve ever had because of how the film ends (suffice for this purpose² to say that it ends with a miracle). Very early on, Johannes, as clear a Christ figure as a film director ever made, lights some candles and places them by a window. Another character comes along, smiles indulgently at the unpragmaticness of the act, and then snuffs the candles out and puts the candelabra away. What’s the point of placing candles by an open window on a Danish night? And this fairly obviously symbolic act is not done by the character whom you would think would represent Secular Worldliness (and not because there aren’t such characters in ORDET). The film, though fictional, is as straightforward a Biblical story as it gets. The source play was written by Kaj Munk, a Danish pastor who was killed by the Nazis in 1944 and who said, among other things, “it is better that Denmark’s relations with Germany should suffer than its relations with the Lord Jesus should suffer.” As clearly as anything, ORDET is about the miracles the Lord Jesus can produce for us when we have faith and hope. Well, perhaps I do think there’s such a thing. Johannes’ berates early on “Ye of little faith” and the final miracle only comes about when someone asks for it simply, and trusts in Johannes absolutely. A Christian must place his whole self at the Lord’s disposal and trust completely in Him, regardless of the apparent consequences, and anything less than that is a fraud that the film rebukes. Which makes the next paragraph not an easy one to type. Don’t get me wrong, I’m not saying ORDET has actually *persuaded* me I’m wrong about “torture.” I do think there are quite fundamental distinctions between a person and a polity. Unlike a person made imago dei, a polity is purely a conventional agreeement among men.³ I’m not sure that a secular non-consecrated polity *should* operate on the basis of Christian hope, that it *should* abandon man’s wisdom, and that perhaps it *is* better than America’s relations with the Lord Jesus should suffer than its security. Machiavelli put it with his customary directness when he said he loved his country more than his soul — and for the leader of a secular non-consecrated polity, I’m not sure he’s describing an inadmirable trait. 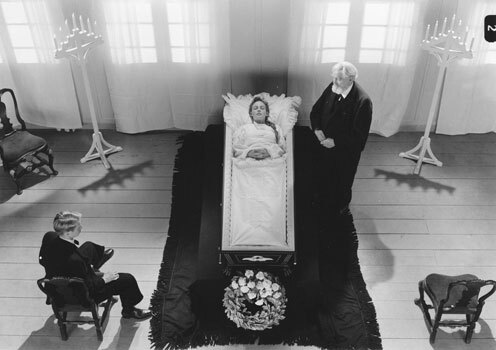 1 … including as the wife Inger, Birgitte Federspiel — who died last year but who decades after ORDET would go on to play one of the sisters in BABETTE’S FEAST, a St. Blogs favorite. 2 … and for minimal spoiler-avoidance. If you’re a Christian or (OR) a film buff and haven’t seen ORDET, you should. You really should. If you’re both and haven’t seen ORDET — shame on you.